For some time now, New York-based Croatian artist Vlatka Horvat has been hovering on the peripheries of wider recognition. In recent years, however, her powerfully nuanced practice has earned her growing numbers of admirers and a rising international presence. Horvat seeks, in her own words, "... to present disappearances, absences, concealments ... resulting in images and documents that are at once comical and unsettling, imbued with fragments, holes and gaps." Working in a wide range of mediums including photography, performance, installation and works on paper, many of Horvat's projects are serial or repetitive in nature, allowing for the gradual concatenation of lacunae and half-glimpses into more substantial form. The Parts Works series, for example, assembles details from identical portrait photographs into multiple permutations that emphasise the multi-faceted nature of identity. 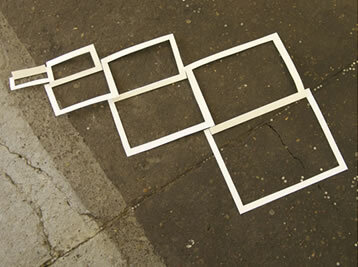 For Pages, (above) sheets of white paper are cut into frame-like shapes whose internal absences are as much a presence as their physical form. In another work, piled sheets of white paper are stamped with the phrase "what remains". As visitors remove sheets from the shrinking stack, the phrase shifts constantly in terms of the transitionary quantity to which it it alludes, as well as its ever-changing reference to what is no longer present. 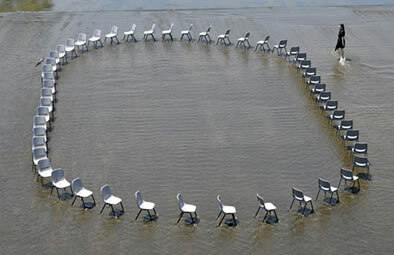 The performance piece This Here and That There (above left) - one of the artist's better-known works to date - sees Horvat continually re-arrange fifty chairs over an eight-hour period, their shifting permutations not only defining spatial relationships, but the potential interaction of absent occupants. Performed in a river in both Los Angeles and Berlin, the constant flow of water emphasises the artist's concerns with a kind of Heraclitan flux, the mutability and contradictions inherent in notions of permanence or absolute presence. Conveying such oppositions with a beguiling lightness of touch, Horvat is well on the way to distinguishing herself as an artist of unusually lyrical talent.